Did you know that there are over twenty different breeds of cats with solid black coats?! No wonder there are so many different superstitions throughout history from different corners of the world about these cuddly little guys. Some folklore says they are signs of bad or good luck and some even go further to say the type of luck depends on the direction the cat was walking! Sailors believe a black cat to be the best 'ship's cat' aboard a vessel to ensure safe travels, while Medieval folk believed them to be half demon and half sorcery. So, yes humanity has been torn when it comes to an official opinion on black cats but that can all change! Have your 'puurrrfect' kiddo use this Child Black Cat Kit to magically transform into a beautiful Bombay kitten! 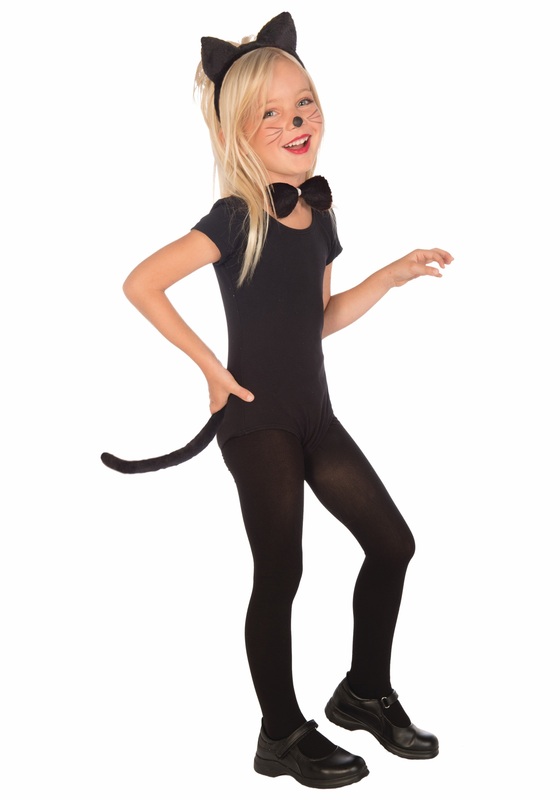 Your little kitty will be the cutest creature around town on Halloween. Everyone will finally see the black cat for what it really is, not a symbol of luck or an omen, but a majestic and playful animal! Have the most adorable kid on the block and help to clear the black cat's reputation with this fun costume kit! Cute ear headband and bow tie however elastic on tail broke when putting on.